When you stay at The Ashbrooke, you’ll find much more than your average Door County hotel. We offer six sophisticated styles of rooms and suites in picturesque Door County. When you stay at The Ashbrooke, you’ll be just a short walk or drive away from the area’s top restaurants, theatres, and museums. The Ashbrooke is an adults-only haven in Egg Harbor. All our Door County WI accommodations offer free Wi-Fi, a built-in wet bar, a coffeemaker with Starbucks coffee, and luxury bath products. Our plush Signature Rooms include a king bed, in-room two-person whirlpool, and gas-burning fireplace. Make your stay with us even more special by booking one of our Grand Whirlpool Suites. These spacious apartment-style suites feature 600 square feet of luxury. This includes a separate living room, two-person whirlpool, and terry cloth robes. All our accommodation types are non-smoking. Our beautiful boutique hotel is in the heart of Wisconsin’s scenic peninsula. Picture this: Start your morning off with coffee and pastries in the lobby. Spend the day exploring the magnificent state parks, eating delicious seafood, or attending a theatre performance. Then, return to The Ashbrooke, soak in the 12-person whirlpool, and watch the sunset from our spacious terrace. Are you ready for your Door County adventure? We invite you to explore all that The Ashbrooke has to offer and start planning your romantic getaway. Your destination for two awaits. 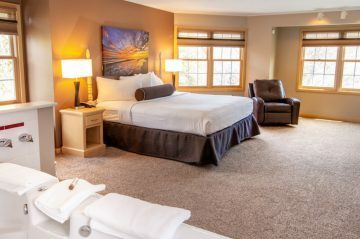 Browse our exquisite Door County rooms below and begin planning your trip to The Ashbrooke today!